Fire Safety Signs are required in even the smallest commercial premises. We offer a full fire safety sign service in London, Surrey and across the South-East, leaving you fully fire safety compliant. Fire Safety Signs are important. They are designed to help the occupants of a building fight a small fire and swiftly evacuate the premises. You can find out about the different types of fire safety sign here. All commercial premises are required to provide some fire safety signage – at the very least a Fire Action Notice and a Fire Extinguisher ID sign. Otherwise they may not meet the regulations set out by the Fire Safety Order (read more about the Fire Safety Order in our blog). Customers across London, Surrey and the South-East often tell us they are unsure which signs they need and where to put them. This is why we offer an end to end fire safety sign service which we guarantee will leave you fire safety compliant. 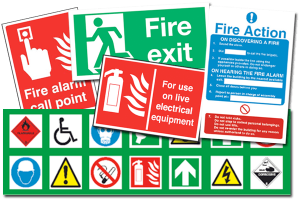 Our fire safety sign service includes an assessment of your premises for safety sign requirements, supply of the correct signs in high quality materials which are compliant with British Standards, and the fitting of the signs in the correct locations. 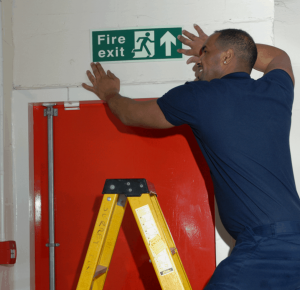 Our fire safety sign engineers have been trained by certified Fire Risk Assessors, and the signs we supply are long-lasting photo-luminescent rigid plastic, so you can be confident you’re within the law. To help you keep your costs down, if you combine your fire safety sign visit with a fire extinguisher service visit you will only pay for an engineer to come out to you once. Because a premises’ lighting may fail if there’s a fire, fire safety signs are photo-luminescent. This is so the glow of the signs can help occupants make their way out of the building and find fire-fighting equipment. Which signs you require depends on what your premises are used for, how they’re laid out, and which fire-fighting equipment you have. A complex building with many floors and corridors, or a building which routinely stores hazardous materials will need more fire safety signs than a small, one-storey, one room building (for example). Includes information such as how to call the fire brigade, which exit to use to leave the building and where the assembly point is. Tell occupants how to get out of a building in case of fire, where the fire exits are, and where they should gather during an evacuation. They also include signs which instruct occupants to keep fire exits clear and accessible. Shows where to find fire-fighting equipment such as fire extinguishers, hose reels and dry risers, as well as pointing out the location of fire alarm call-points for raising the alarm. These signs warn occupants of potential fire risk, such as highly flammable materials, or give instructions ‘not to do’ something which could spark a fire. An obvious example of this is the ‘No Smoking’ sign.